You've heard the John Green quote... "Sometimes you read a book and it fills you with this weird evangelical zeal, and you become convinced that the shattered world will never be put back together unless and until all living humans read the book." Beautiful, right? Well, this happened to me. Smacked-me-in-my-chest and made-my-spirit-soar happened to me. With this book. This. right. here. 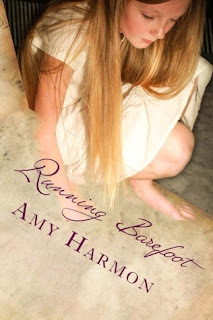 Running Barefoot by Amy Harmon. Here's the blurb: When Josie Jensen, an awkward 13-year-old musical prodigy, crashes headlong into new kid Samuel Yazzie, an 18-year-old Navajo boy full of anger and confusion, an unlikely friendship blooms. Josie teaches Samuel about words, music, and friendship, and along the way finds a kindred spirit. Upon graduation, Samuel abandons the sleepy, small town in search of a future and a life, leaving his young mentor behind. Many years go by, and Samuel returns to find his old friend in need of the very things she offered him years before. Their roles reversed, Samuel teaches Josie about life, love, and letting go. Deeply romantic and poignant, 'Running Barefoot' is the story of a small town girl and a Native American boy, the ties that bind us to our homes and families, and the love that gives us wings. Oh my goodness.. you know when you've just finished reading an incredible book and your heart has just swelled and filled with wonderment at the words you've just breathed in? That is how I feel about finishing this novel. I am absolutely heartbroken that it is over. Hands down one of my all time favorite reads of all time!!!!! It was so unexpected, and I never realized how much I would come to care for these two characters. Josie and Samuel... their relationship was so pure, so beautiful, moving, life altering. My heart broke for their struggles, their hardships, everything they had to endure, but it was filled up with love and hope again by the lessons learned, the classical music, the Navajo stories, the rich language and culture. After hearing her speak and gaining insight into her mind, I wanted to become Josie's best friend! Why didn't anyone else take notice of this precious, beautiful human being in school?? She became the epitome of a strong heroine, and NOT ONCE was she lowered in my eyes. Her character was strong but soft, feminine but tom boyish, smart but innocent. She was a dichotomy within her own self and she was totally, utterly loveable because of it. Well done Amy Harmon. You just won a lifelong fan in me. I'm now going to go read your other novels. And when my tender heart has healed from this book, I will revisit it again and again. In the meantime, Debussy's "The Girl with Flaxen Hair" has become my new fav song and the scene in which this song inspired, one of my all time favorites from the book. You have inspired me as a writer. And she has. The author has inspired me to pick up my virtual pen and write again. Or at least wrack my brain around for some ideas to write before I jot things down. Because I WANT TO WRITE LIKE THIS. This epic, beautiful and enchanting story is why I love to read, and what inspires me to push myself forward to write. Thank you Amy Harmon for the beautiful words, for an exquisite story, for becoming a writer! DO IT NOW! :) You will love it, trust me. I'm in awe of this writer. She's amazing. Great review! Running Barefoot is definitely the best book I've read in a long time, and the only one I've ever felt so strongly about that I keep talking about it to friends, strangers, enemies. I know, I'm telling my sister, girlfriends about it. I just had to blog about its amazing-ness! If you come across a simialr book, please recommend my way!